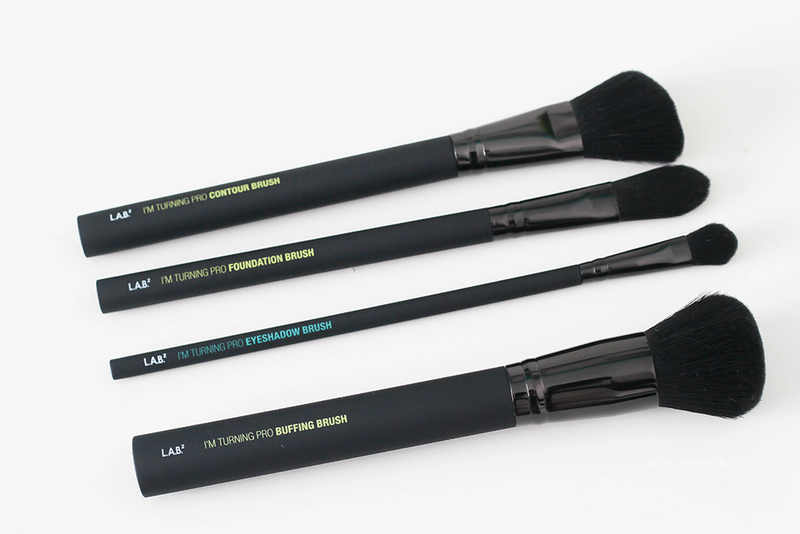 L.A.B.2 Cruelty Free & Vegan Brush Kits. 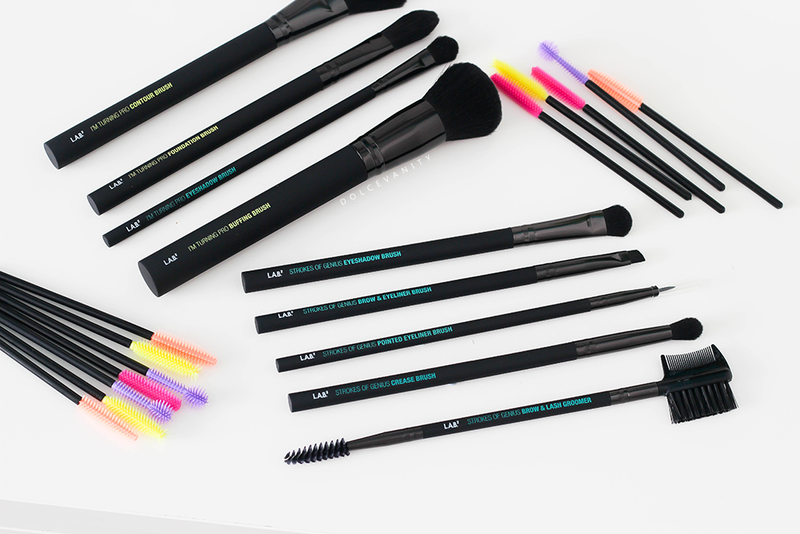 I feel finding good makeup brushes are key, I have various brushes from different brands and now I've been trying out these cruelty free brush kits from L.A.B.2 which means " Live And Breathe Beauty". The 3 different kits available: I'm Turning Pro, Strokes Of Genius & Lash Out Loud. A black sleek box with a neon coral inner, inside the I'm Turning Pro & Strokes Of Genius kit sits a foam block the same colour scheme as the packaging that holds the brushes - once the packaging is opened you can lift the foam block out that's glued down and have a holder if necessary. I've kept them in the block, quite liked it. On the back of the packaging you'll notice you can cut out a "How To Use" guide for each brush available, I think that's great for novices. 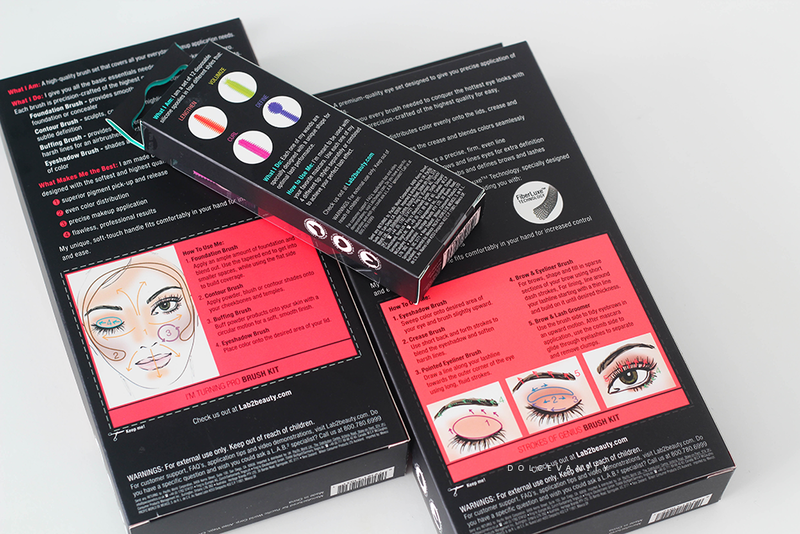 It also notes on the box that it's been made with love, cruelty free & vegan & hypoallergenic, dermatologist tested! Contour Brush - medium to high density angled brush, the brush head is a small to medium size meaning that you can get a more precise contour instead of a larger brush that'll cover such a huge area, this'll allow more control and room to build up. Foundation Brush - this is a flat tapered flat brush, with medium density, soft bristles, I experienced no scratching or bristle fall out. As it's quite a small head it's ideal for using on & around the nose and eyes but I like to use this more for heavy concealing under the eyes with a liquid concealer, the bristles are quite flexible allowing long strokes but for foundation I found short, quick strokes over the face gives a light, natural appearance. I used this with cream foundation and loved it. I don't like to have lots of foundation on and found that even using just the brush with the foundation swiped on once was enough coverage and it was flawless to use. Once applied using the brush again to spread the foundation on and blend it out was all I needed to do. I don't see why others are giving it a bad rep for foundation use. Eyeshadow Brush - I found this was good to pack on eyeshadow, it's stiff enough to picks up enough product to use on the lid space stiff. It's not too stiff of an e/s brush, it leaves room for movement to sweep the eyeshadow across, I liked to use this to blend out colour, it fits into those areas on my eyes perfectly and the bristles work a lot better. Buffing Brush - a high density brush, it's a good size for a buffing brush, it's not as large as other buffing brushes I've got, when buffing in any powder like setting powder it allows better application on smaller faces and smaller areas on the face. I've not tried it with foundation but this could be a multi-use brush. Eyeshadow Brush – A very different e/s brush to the one above. More dense, little slimmer and picks up more product to pat onto the lid. Crease Brush – dome shaped brush, makes it easier to do a defined crease, it's a medium size so it's good if you've got the crease for it. It picks up product well, I tap off excess before going into the crease. Pointed Eyeliner Brush – small, slim tipped brush. Good for liner, giving small strokes but I'll tell you what I do really like to use it for, detailed lipstick outline, it's small enough for that, to do a precision lip line. Brow & Liner Brush – It's dense and a little stiff but has slight movement, it picks up a fair bit of product. I generally use a pencil for my brows now but if I need a brush that's going to give me a fair amount of product such as with a powder or pomade, I'd use this. Even for an eyeliner it works well especially for a thick wing. Brow & Lash Groomer – What I do like about this especially is that the spoolie is on the end, I didn't expect that when I took it out of the foam. It's your standard brow and lash groomer. So far with all these brushes, I've not experienced any cons. The brushes all follow the same bristle consistency with the touch, being soft on the face and eyes. The fibres on these bristles have a micro-studded surface, mimicking the exterior cuticle of the finest natural hair. They say that due to the fiber technology it''ll not lose shape, breakdown or degrade, basically they're built to last and keep shape. The metal used to clamp the bristles into place is of the highest quality, non corrosive, resistant to damage. Also it's double crimped to prevent the bristles shedding and detaching - makes sense as to why I've not had any shedding as of yet. 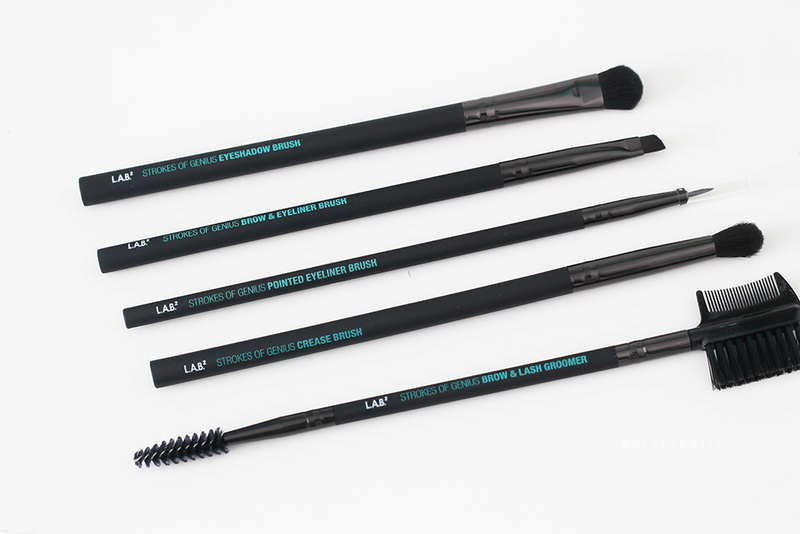 The rubber matte black handle, allows good gripping and also displays the kit name and brush type so you'll always know what collection it goes from & what you can use the brush for. Making these good brushes for gifts, personal and professional use. 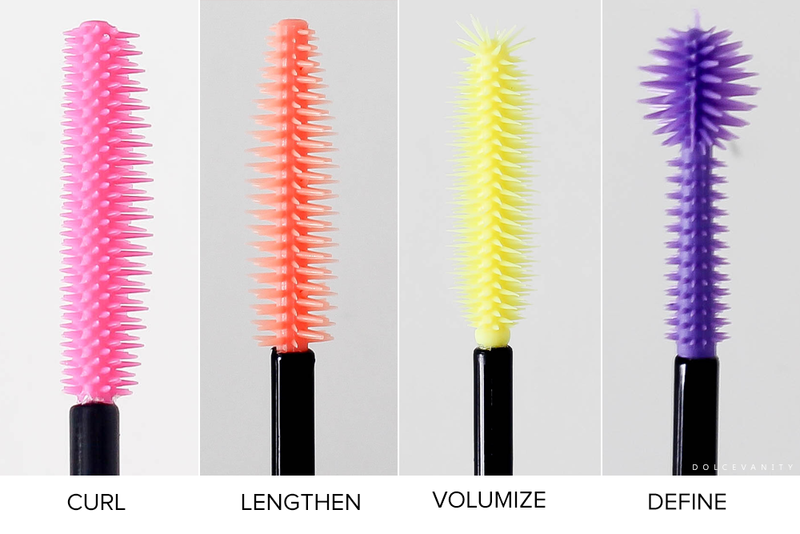 12 disposable mascara wands, 3 of each in bright bold colours. I think this is really good to have brushes of different types available for different reasons : CURLING. LENGTHENING. VOLUMIZING. DEFINING.. It gives you the opportunity to use your favourite mascara with different results thanks to a brush. I've found these online for £4.99 These are to be used once and then disposed of. I think these are a good idea, it could get costly and might not be for everyone. Make-up artists would probably love to have these in our kits but cheaper & more bulk options might be found elsewhere. Heard of L.A.B.2 before? What do you think of the brushes? Solid, sending this on to my girlfriend now! Hope she likes the idea of these. This brand looks great. I like that they are cruelty free, I also like the idea of the mascara wands. It's amazing they're cruelty free! No worries where I'm spending my money! I'll look out for these - I get horrible reactions to some brushes so am on the hunt for some new ones! Looks like a great set! I love the idea of using different mascara wands with your mascaras too! Yeah, it makes quite a little difference just the shape of the brush. They look so sleek and stylish, and I love the fact that they are so friendly. Me too, it's a great selling point and makes it easier for those seeking them too. They truly are. It's beautiful. I got their brushes at a brand event and the brushes feel really soft on my skin. I like that the brand is cruelty free as well . I know, right. I love how soft they are. Who needs real fur!? These sound amazing! I love the packaging,and the fact that they are cruelty free! The packaging is helpful for novices and the cruelty free is a most have for me. It's interesting, right! You'd just never know until you try :) It's one to pick up that's for sure. These brushes sound great. I like that they're cruelty free and they're super unique! Totally agree, I've not seen any with this new fibre technology. I am really sensitive with brushes so these choices might fit on me. The designs are innovative and lively. Think these would be a good fit, I think these brushes would be perfect. Interesting! Sounds like a super range of products for vegans. I love that there are so many cruelty free brands on offer now - these look like great brushes too. Me too, it's not as scarce as it once was. My vegan friend's birthday is coming up and I'm sure she'd love these :) Great that there aren't really any cons! This sounds like a great brand, love the look of the mascara wands! These look great. I'm actually looking for new brushes so will look out for these. I'm glad you like them too! I love good make up brushes, they make such a huge difference. I've thrown away so many mascara's because I've hated the brush shape. Oh dear! It does happen but hopefully if you try these - problem solved. I've not heard of LAB2 before but I'm intrigued. Been wanting to try out some new brushes so I'm glad that overall you didn't find many problems! I love those mascara brushes! I always get the same mascara just because of the brush when I would actually like to try out some others! Yes it's a rare thing and I'm glad no issues have occurred. Yeah a lot of people love different brushes more than companies know. Yeah it's true, I've wiped mine down in alcohol to clean them as it can seem like a waste to throw them and would get quite costly. I am very lucky to own a whole set of their entire range apart from the new mascara wands. I absolutely love them and use them every day!! I do love an ethical company! An I'm so drawn to those colourful mascara wands - I can't resist anything brightly coloured!